This wonder of modern dentistry will be carefully placed where your original tooth used to be. It’s fairly quick to do and rarely uncomfortable. After a short healing period, your dentist will attach a beautiful new replacement tooth to the implant. Everything you used to be able to do with your natural teeth can be done again with implants! Your dentist will perform the implant procedure and your restorative dentist will add the prosthesis. 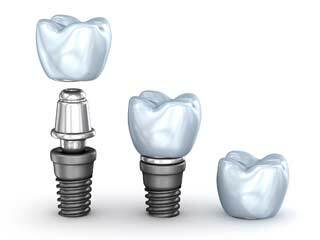 A single tooth implant is the most natural looking way to replace a missing tooth. When designing a case to replace several missing adjacent front teeth, a restorative dentist or implant specialist may recommend a dental implant bridge instead of individual crowns. The reason for this is that due to anatomic limitations, replacing front teeth with crowns will often produce poor esthetic results and compromise your natural teeth. Implant supported dentures can bring back normal function and a confident smile for people who are missing many or all of their teeth. No longer do patients need to suffer from ill fitting dentures that prevent proper chewing function and can create embarrassing social situations. Patients consistently comment that they wish they would have had implants placed years earlier. People who, before implants, only ate soft foods are now enjoying steak, chicken, and even corn on the cob. Plus, a well-secured denture improves confidence, quality of life, and well-being.